At the Danieli Chocolate shop on Richmond Green, we celebrate all things chocolate with figures, drinking chocolate and novelties. Our manager Jo has been working in this location for 15 years, and with Bridget’s nutritional expertise we have introduced vegan chocolates, diabetic chocolates and also cater for customers looking for dairy and gluten free treats. Our Chocolate Shop is situated in a perfect location on Richmond Green. 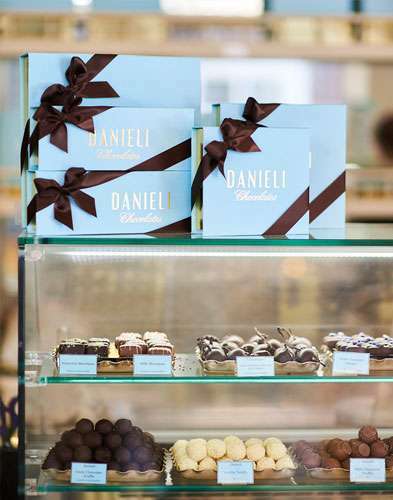 Previously known as the House of Chocolate, Danieli’s took over the business in Spring 2011. ​In summer we offer both chocolates and ice cream. Whereas, in the winter we dedicate the shop to a vast selection of delicious chocolate and sweets, wrapped to suit any occasion.